9:0.1 A STRANGE THING occurred when, in the presence of Paradise, the Universal Father and the Eternal Son unite to personalize themselves. Nothing in this eternity situation foreshadows that the Conjoint Actor would personalize as an unlimited spirituality co-ordinated with absolute mind and endowed with unique prerogatives of energy manipulation. His coming into being completes the Father’s liberation from the bonds of centralized perfection and from the fetters of personality absolutism. And this liberation is disclosed in the amazing power of the Conjoint Creator to create beings well adapted to serve as ministering spirits even to the material creatures of the subsequently evolving universes. 9:0.3 The Infinite Spirit, the Conjoint Creator, is a universal and divine minister. The Spirit unceasingly ministers the Son’s mercy and the Father’s love, even in harmony with the stable, unvarying, and righteous justice of the Paradise Trinity. His influence and personalities are ever near you; they really know and truly understand you. 9:1.3 While you envisage the Father as an original creator and the Son as a spiritual administrator, you should think of the Third Source and Center as a universal co-ordinator, a minister of unlimited co-operation. The Conjoint Actor is the correlator of all actual reality; he is the Deity repository of the Father’s thought and the Son’s word and in action is eternally regardful of the material absoluteness of the central Isle. The Paradise Trinity has ordained the universal order of progress, and the providence of God is the domain of the Conjoint Creator and the evolving Supreme Being. No actual or actualizing reality can escape eventual relationship with the Third Source and Center. 9:1.7 And herein is an infinite mystery: That the Infinite simultaneously revealed his infinity in the Son and as Paradise, and then there springs into existence a being equal to God in divinity, reflective of the Son’s spiritual nature, and capable of activating the Paradise pattern, a being provisionally subordinate in sovereignty but in many ways apparently the most versatile in action. And such apparent superiority in action is disclosed in an attribute of the Third Source and Center which is superior even to physical gravity—the universal manifestation of the Isle of Paradise. 9:2.5 The presence of the universal spirit of the Eternal Son we know—we can unmistakably recognize it. The presence of the Infinite Spirit, the Third Person of Deity, even mortal man may know, for material creatures can actually experience the beneficence of this divine influence which functions as the Holy Spirit of local universe bestowal upon the races of mankind. Human beings can also in some degree become conscious of the Adjuster, the impersonal presence of the Universal Father. These divine spirits which work for man’s uplifting and spiritualization all act in unison and in perfect co-operation. They are as one in the spiritual operation of the plans of mortal ascension and perfection attainment. 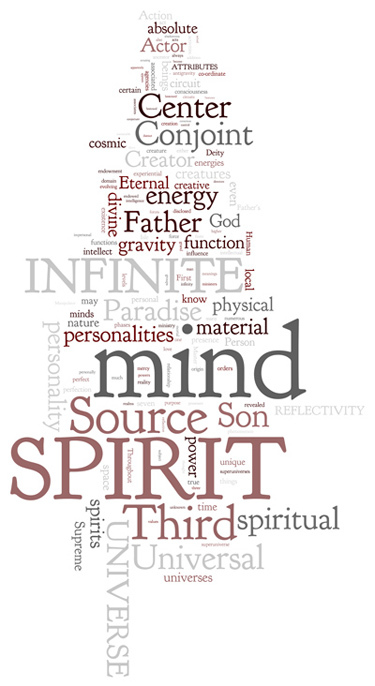 9:3.2 The Infinite Spirit possesses a unique and amazing power—antigravity. This power is not functionally (observably) present in either the Father or the Son. This ability to withstand the pull of material gravity, inherent in the Third Source, is revealed in the personal reactions of the Conjoint Actor to certain phases of universe relationships. And this unique attribute is transmissible to certain of the higher personalities of the Infinite Spirit. 9:6.4 Selfhood of personality dignity, human or divine, immortal or potentially immortal, does not however originate in either spirit, mind, or matter; it is the bestowal of the Universal Father. Neither is the interaction of spirit, mind, and material gravity a prerequisite to the appearance of personality gravity. The Father’s circuit may embrace a mind-material being who is unresponsive to spirit gravity, or it may include a mind-spirit being who is unresponsive to material gravity. The operation of personality gravity is always a volitional act of the Universal Father. 9:8.9 There are creator personalities and creature personalities, and in addition to these two fundamental types there are personalities of the Third Source and Center, beings who are personal to the Infinite Spirit, but who are not unqualifiedly personal to creature beings. These Third Source personalities are not a part of the Father’s personality circuit. First Source personality and Third Source personality are mutually contactable; all personality is contactable. 9:8.10 The Father bestows personality by his personal free will. Why he does so we can only conjecture; how he does so we do not know. Neither do we know why the Third Source bestows non-Father personality, but this the Infinite Spirit does in his own behalf, in creative conjunction with the Eternal Son and in numerous ways unknown to you. The Infinite Spirit can also act for the Father in the bestowal of First Source personality. 9:8.11 There are numerous types of Third Source personalities. The Infinite Spirit bestows Third Source personality upon numerous groups who are not included in the Father’s personality circuit, such as certain of the power directors. Likewise does the Infinite Spirit treat as personalities numerous groups of beings, such as the Creative Spirits, who are in a class by themselves in their relations to encircuited creatures of the Father. 9:8.12 Both First Source and Third Source personalities are endowed with all and more than man associates with the concept of personality; they have minds embracing memory, reason, judgment, creative imagination, idea association, decision, choice, and numerous additional powers of intellect wholly unknown to mortals. With few exceptions the orders revealed to you possess form and distinct individuality; they are real beings. A majority of them are visible to all orders of spirit existence. 9:8.13 Even you will be able to see your spiritual associates of the lower orders as soon as you are delivered from the limited vision of your present material eyes and have been endowed with a morontia form with its enlarged sensitivity to the reality of spiritual things. 9:8.24 These groups serve on Paradise, in the central or residential universe, in the superuniverses, and they embrace orders that function in the local universes, even to the constellations, systems, and planets. 9:8.25 The spirit personalities of the vast family of the Divine and Infinite Spirit are forever dedicated to the service of the ministry of the love of God and the mercy of the Son to all the intelligent creatures of the evolutionary worlds of time and space. These spirit beings constitute the living ladder whereby mortal man climbs from chaos to glory.